A sculpture in a Yorkshire beauty spot is to be relocated after its popularity among visitors caused moorland erosion and litter issues. The Seated Figure on Castleton Rigg was built in 2017, five years after it was given planning permission. Following concerns for the heath from landowners, the 10ft (3m) bronze piece will now be relocated to the Yorkshire Sculpture Park. 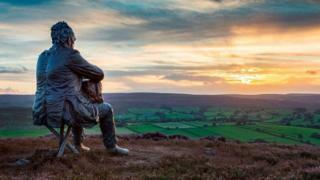 The North Yorks Moors Authority said the artwork would be "missed locally". During its two years sitting in Westerdale the figure had become increasingly popular with walkers and tourists. Artist Sean Henry was commissioned by the David Ross Foundation to create the sculpture. "I'm sad to see Seated Man leave the unique surroundings of the North York Moors, but at the same time excited about the new installation," Mr Henry said. Image caption The artist said "it was important to let the moorland recover"
The North York Moors National Park Authority said the "well-liked landmark" would be more accessible at the Yorkshire Sculpture Park, near Wakefield. "Its overwhelming popularity was leading to moorland erosion, litter and parking issues, which caused concern for local landowners. The installation will go on display in May.